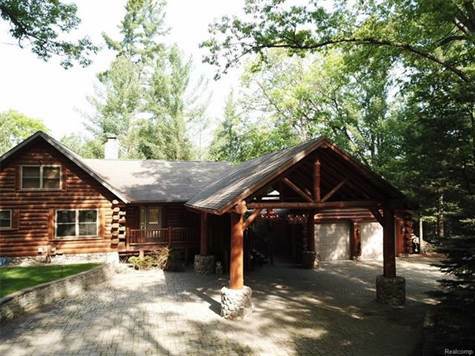 Newer Log Cabin on approximately 10 acres located on the Rifle River. Beautiful area. Very serene, wooded setting. Come see Luxury Log Living at it's best. Guest house and Pole Barn included. Pole Barn is heated with bathroom kitchen, well and septic. Main home comes with 2 wells. Over 2,000 feet of river frontage, great for fishing. Paved driveway. Easy freeway access to I-75, only 2 hours from West Bloomfield. 3.7 of the 10 acres is a buildable lot to create an extension to the property. Sale includes parcel 014-036-018-64. Come live the dream! !